Looks like Charlie Sheen is not winning anymore, since he is set to announce that he has contracted the AIDS virus and is HIV positive in an interview with Matt Lauer on the Today show this Wednesday. Actually, he is still winning because he’s surviving the once-deadly disease and according to TMZ he has a low viral load and the virus is currently undetectable in his blood thanks to medications he has been taking. Maybe Sheen does have tiger blood, or maybe medical science is winning also. 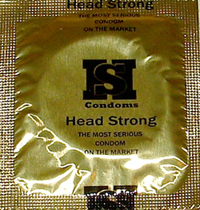 Kirk Manuel, CEO of Head Strong Condoms, is trying to make condoms available to lower income black communities through the omnipresent dollar store. "Dollar stores are in low-income neighborhoods, but try finding a condom in one of those stores. They're not there and it's a tragedy," he says in a statement. "You can find liquor, you can find tobacco, but you can't always find condoms, we need to do a better job educating, and we need to do a better job making condoms available too," Manuel, who is African American, started his company after learning HIV-infected adults were knowingly infecting others with the virus and holds a "no excuses" philosophy at his company. "There is no excuse for not using a condom," Manuel says. "If you can't afford condoms, there are places you can get them free." The recent headlines, concerning a new study on HIV/AIDS, have been frightening: "Genetic Variation May Raise AIDS Infection Risk in Africans " (Bloomberg.com) AND "Scientists Make Gene Link To African HIV Epidemic" (Times Online). But the media and even the scientists may be jumping the gun by making such bold declarations. A new study published in the Cell Host and Microbe journal has researchers concluding that sub-Saharan Africans and their descendants are more susceptible to the HIV virus because of their genetics: the lack of a Duffy Antigen Receptor for Chemokines (DARC), commonly referred to as the Duffy protein. In the presence of the protein, according to the study, HIV particles are absorbed--diminishing the virus’ chances of infecting vulnerable white blood cells. However, the absence of the Duffy protein acts as a protector from the malaria parasite. The results and interpretations of this study provide a plausible explanation for the disproportionate number of African and African-Americans affected by the HIV virus in relation to their European counterparts. It also deflects from the common excuse of sexual behavior patterns. But it should not be overlooked that declaring an ethnic group genetically predisposed to fall prey to a modern day plague smacks of racial propaganda. Cheryl Winkler, head of the Laboratory of Genomic Diversity at the National Cancer Institute, in Frederick, Md. cautions, "This definitely requires more study and replication of results before you can make these assumptions. They have a model here, but they don't have enough evidence." Let us not forget that it is often argued in the scientific field that the bias of researchers and their preconceived notions and hypothesis can skew data results. In other words, researchers might be discovering exactly what they’re looking for and possibly overlooking other factors. It should also be noted that the study was conducted exclusively on American military personnel which not only eliminated many of the socioeconomic variables that might have an impact on HIV susceptibility but also excluded Africans from the study. 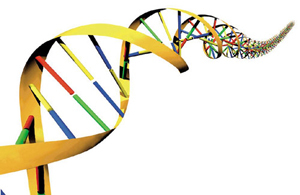 David Goldstein, a Duke University population geneticist who studies HIV genetics, points out that African Americans have an especially diverse genetic heritage making it more difficult to link a particular gene to HIV susceptibility. If the study didn't include any Africans why are they being accused of genetic shortcomings in the headlines?